Wear your shade swim top. Good used condition maybe a tiny over all fade. This swim suit is new and unworn. Due to the intimate nature of this item. Machine wash. Fit, like beauty, is subjective. is the model wearing lots of layers under the item?. 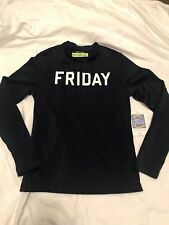 Do you have other sizes available of an item that is listed?. I AM NOT AFFILIATED WITH OR SPONSORED BY J CREW.100 % AUTHENTIC J CREW. Machine wash. This style features UPF 50 sun protection (think of it as sunscreen for your clothes). Item F1492. 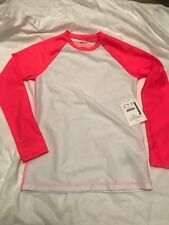 J CREW CREWCUT GIRLS COLORBLOCK RAGLAN-SLEEVE RASH GUARD SZ.10 NWT NEON PINK/WHITE #F1492 Our supercute rash guards—like this cute colorblock version—have a comfy fit and smart UPF 50 sun protection (think of it as SPF for clothes).